Warning: big spoilers for Game of Thrones ahead! Despite spending weeks poring over the official trailer and photos from the set, nothing could prepare us for the eighth season premiere of Game of Thrones. The episode opens with an eerily familiar sequence. Soldiers march along a road lined with curious faces. A child, young Lord Umber, scurries through the crowd in an attempt to get a better glimpse of the royal procession that follows the fearsome army. The camera swoops down and captures the face of Ayra Stark who smiles at the boy. Only then do we begin to understand that the scene parallels Ayra's own introduction to us from the first episode of the series when King Robert Baratheon's family first arrived at Winterfell. In a way, the entire sequence is a subtle nod to how this episode is the beginning of the end to the series. However, the opener isn't the only place this episode ties the past to the present, so let's review a few other points in the episode to see if we can find other parallels. In the first episode, three rangers of the Night's Watch go beyond the Wall to investigate reports of wildlings in the Haunted Forest. They soon discover a number of wildling corpses dismembered and arranged in a ritualistic fashion on the ground. They also find a dead wildling girl pinned to a tree. This parallels Tormund, Dolorous Edd, and Beric Dondarrion's journey to the Last Hearth, a location just south of the Wall near Castle Black. The trio finds Lord Umber pinned to the wall of the castle amid a series of severed limbs placed in a spiral around his body. An echo to the beginning and a reminder that a threat is nigh. During the first episode, Tyrion Lannister bypasses the Lannister trip to Winterfell in favor of visiting a brothel where his brother Jaime interrupts him mid-romp on Queen Cersei's orders. In the season eight premiere, Qyburn interrupts Bronn's sexual escapades by order of Queen Cersei with an offer to kill Jaime Lannister. In the series opener, King Robert Baratheon asks Eddard Stark to be his Hand of the King while the pair are in the crypts of Winterfell. 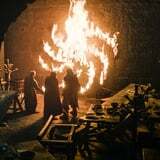 In the season eight opener, the crypts are where Samwell Tarly tells Jon Snow that he's actually a Targaryen and the true heir to the Iron Throne. If you recall, Jon Snow gave Arya Stark her sword, Needle, in the second episode of the first season. During their reunion at Winterfell, Jon recalls the memory of that day asking, "Have you ever used it?" Whereupon Arya answers, "Once or twice." The pilot episode ends with Jaime pushing young Brandon Stark out of the window when the boy witnesses the Lannister twins making love. The season eight premiere ends on a similar note, with Jaime entering Winterfell and coming face-to-face with Bran for the first time since that fateful day.